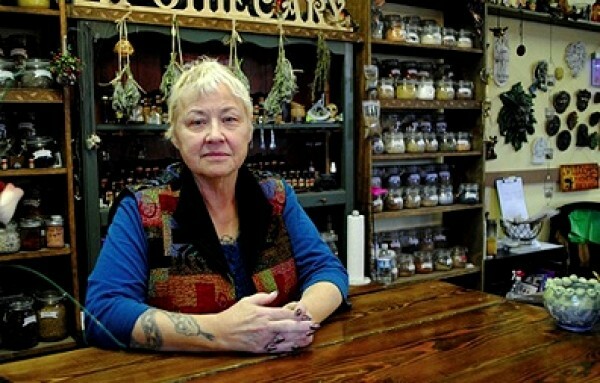 Rita Morgan is co-owner of Crone’s Hollow, a magical-supply store and pagan community center (2470 S. Main, Salt Lake City, 801-906-0470, CronesHollow.com). She also practices traditional witchcraft and is the leader of local coven Earth Haven. Morgan was one of the panelists in Crone’s Hollow’s annual open-to-the-public panel discussion about paganism in Utah, where attendees could ask the panelists about their respective spiritual paths. Morgan sat down with City Weekly and her three Bengal cats to discuss witchcraft, paganism and how people who are interested in pagan spirituality can get started. What does the word “pagan” mean? The definition of paganism refers to anyone whose belief structure is non-Christian. That would include, or to seem to include, alternative spiritualities such as witchcraft, Asatru, the other Greco-Roman belief structures, but also things like Buddhism, Native American spirituality and things of that nature. However, the Buddhists and the Native American people don’t like to be called pagan. Generally, the word “pagan” means someone who lives in the country. And it was meant sort of as an insult originally because it was generally believed that the people who did not live in the cities were kind of country bumpkins, they weren’t very smart, they were illiterate, they were less intelligent, less sophisticated than the people who were city dwellers. It’s a Roman word, which basically means “country dweller.” When the Romans took over and conquered Europe, they brought their religion with them, and of course when they were converted to Christianity they brought that religion with them as well, and people who lived in the cities were the ones that got the advantage of Roman religion, state religion, etc., and the people in the country generally, while they might put an outward show of accepting the state religion, they generally tended to continue to follow their rural, or ancestral practices, and sort of did a blending. Do you identify as a witch or a pagan? I use [“pagan”] as a convenience word because it identifies me as not being Christian. [online] But in actual fact, I’m not a pagan, I live in the city. I am an urban-dweller, I don’t live out in the country, therefore I don’t qualify. What I practice is witchcraft in an urban setting. I would classify myself as a witch, probably more quickly than I would as a pagan, simply because I practice the craft of being a witch. I’m not Wiccan. I practice witchcraft, which is not a religion for me. It is like a blacksmith becomes an apprentice, becomes a journeyman, becomes a master blacksmith. He studies the craft of smithing. It becomes his daily life and may influence his spirituality, [but] it isn’t his religion. And that’s how I approach witchcraft. It’s not my religion, but it is my spirituality. How are witchcraft and Wicca different? Traditional witchcraft generally has to do with non-Wicca. It has to do with craft practices that pre-date the organization of Wicca, pre-date Gerald Gardner. It has to do with dealing with natural laws—and I’m not saying that Wiccans don’t deal with these things as well—but it comes more from a family-oriented or clan-oriented background, and works in that principle. It’s much hierarchical, although it can be, but as I practice—while we do have hierarchy involved in what we do, you have to have a leader—it’s not all about hierarchy. It’s about being family. What’s the coven you are the leader of? The coven is called Earth Haven coven. That [name] might give you the idea that we’re all about preservation of the Earth and ecology, and “save the trees” and vegetarianism and many things of that nature. We are about those things, but that’s not all that we’re about. We have vegetarians in our group; we have people who are carnivorous in our group. It’s mostly about as we live on this Earth, it is our haven. And it is what can protect us and can provide for us, and serve us. It’s about making ethical choices with regard to whatever circumstance you may find yourself in. How do people convert to the pagan path? Many people, when they come out of Christian belief structures or other belief structures, often go into Wicca to learn what alternatives are there—another mindset than just that of believing in an all-powerful God. It generally is geared toward believing in a kinder, gentler, all-powerful goddess, but it is a way to start to think in a different direction. There are many people who don’t even want to do that way, and they come and listen to what people have to say, here or at other gatherings, and try a couple of different things. Is the local pagan community welcoming? There are many public things offered here in Salt Lake. Every Friday night, [Crone’s Hollow has] a social evening called Stealth Coffee, and, basically, it’s come, have coffee—we have a coffee bar in our lounge—and network. People play board games and card games and sit and talk and have coffee, and it’s basically a social evening so you can get to know other people. There are also books that are available that are sort of a beginner kind of learning experience. We have, once a month, a [free] meeting called New to the Community Meet-Up. People sit down with anybody who shows up and discuss what’s available in the community and have a handout that lists several different organizations and groups that are available in the Salt Lake pagan community. And people can talk to them about directions that they might want to go in. What are some misconceptions people have about pagans and paganism? A lot of people think that we sacrifice cats or children or worship Satan—actually, Satan is a Christian god and is not a part of the pantheon that are available or that we deal with in alternative spirituality. Do we believe in good and evil? That’s a tricky question. I tend to look at life in a less black & white format. There’s good, and there’s not-as-good. There’s black & white, there’s positive & negative, there’s yin & yang, there’s up & down, there are opposite polarities of things. And something may be appropriate, and something may be less appropriate. But is it bad and evil? We are comprised of all of those things, and I believe part of our goal, part of our process here, is to find balance between those things. To become an integrated person. And for the most part, that’s what my witchcraft is about … finding natural laws that help me to become a more balanced individual. Because when I become balanced, health—in all aspects of life, not just your physical health: your mental health, your environmental health, your relationship health—is more stable. [Paganism] has nothing to do with the sacrifice of ... animals. I’m not going to say that there aren’t groups that do that type of thing, but I would not classify them as pagan or even having anything to do with witchcraft. Why do you practice witchcraft? Because it’s the only thing that makes sense to me. It’s what makes the sun come up in the morning for me. It is the joy of knowing that I’m following a path that answers questions, makes sense of the things that I experience in life, that allows me to be responsible for myself. It allows me to not be at someone else’s mercy, in my own mind and in my own life. And it puts me in a position where I can help other people come to those realizations as well. To work through patterns that are destructive rather than helpful. For me, the practice of craft and what I do is a song. And it’s a glorious song. And it continues day to day to day. It is that which makes living my life worthwhile.